It’s called Beatlemania for a reason. They were one of the most popular rock bands, they sold out shows, had thousands of fans following them and making camp outside their hotel building, they released one innovative album after another, and they made history over and over again. But by 1966, disaster followed them wherever they went. At the time, The Beatles were spent – literally and figuratively. Passion for music brought them together and the lack of it was slowly tearing them apart. They no longer found joy in concerts – it was way too loud and noisy. They couldn’t even hear themselves. They’d end up altering the lyrics just for amusement. Aside from the boredom, there was also the question of safety. During their stop in the Philippines, they were manhandled at the airport and their security withdrawn after inadvertently snubbing the first family. And they also made enemies after John Lennon’s infamous “More popular than Jesus” remark which earned them the ire of several people including the Ku Klux Klan. Their US tour was marred by protests and threats. Conservative groups publicly burned their Beatles records. Another issue was technology. Back then, they couldn’t easily perform live those songs which were recorded using studio techniques and other effects. They were basically playing tunes they released a few years back and even if they only released Revolver a few days before the tour kicked off, they didn’t play one song from that album. Even nature wasn’t too kind to them. In St. Louis, they were met with heavy rains and only had a makeshift shelter as shield. There were sparks on stage during the performance. At the Los Angeles’ Dodger Stadium, some fans clashed with the police and The Beatles’ getaway car was damaged so they ended up using an armored car to get out of the area. They had enough. Fortunately for them, they only had one concert left. 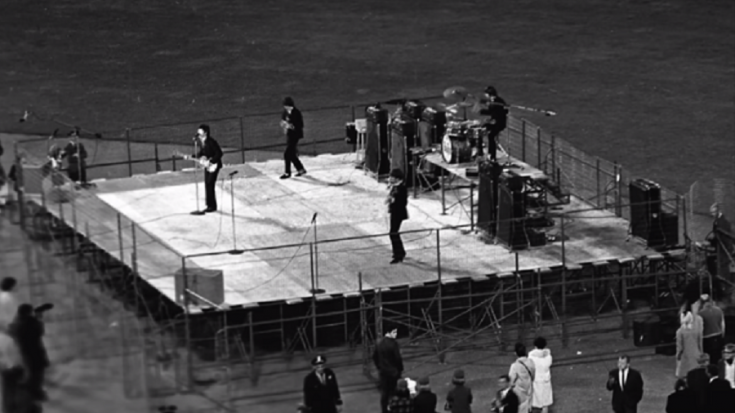 So on August 29, 1966, The Beatles held their final concert at San Francisco’s Candlestick Park. They couldn’t wait to wrap up the tour. At 5:30PM, their chartered jet arrived at the San Francisco International Airport. Contrary to what they’ve gotten used to seeing, there was no hysteria, no high-pitched screams from thousands of fans. Instead, there were members of the press and security detail. They were immediately taken to the stadium and as fate would have it, the gates were locked. When The Beatles finally managed to go to their respective locker rooms, it wasn’t any better. It was utter chaos. The stadium had a capacity of 42,500 but only 25,000 tickets were sold. At 8PM, a local band played the National Anthem followed by the opening act. It was a windy night and with the technology back then, the musicians struggled to be heard by the audience who were around 200 feet away. The Remains performed first, then Bobby Hebb, next was Cyrkl and finally, the Ronettes. In their dressing room, press officer Tony Barrow noticed something different about the boys. And just before they were due on stage, Paul McCartney went up to him and asked him to do something. At 9:27 PM, The Beatles emerged and began performing their 33-minute set. Aside from the wind, they also struggled with the screams. Some overenthusiastic fans rushed to the stage but fortunately, that was all there was to it. The Beatles knew it was going to be their final concert and they wanted to immortalize that moment. It may have been their final concert but it wasn’t the end for them as a group YET. And though they have stopped touring after that show, they still managed to create albums which had a huge impact on rock ‘n roll and music in general.